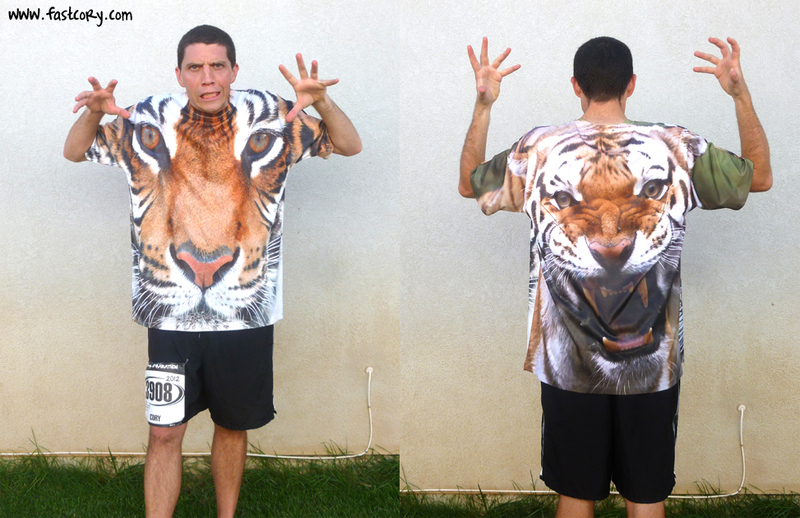 I knew the St. George Marathon was going to go well when I found this awesome $5 shirt at Walmart to wear for the race. Unfortunately the only size they had was HUGE so the shirt was kind of like wearing a mu mu. I was convinced it would make me faster. 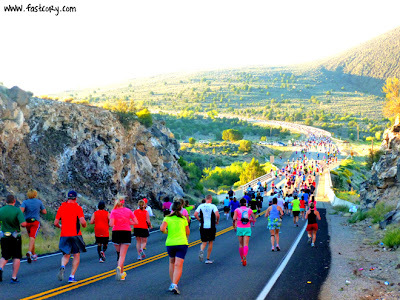 I have been doing almost all my training on trails so I was apprehensive about running 26.2 miles on the road. Fortunately there was dirt on the side of the road that I was able to run on for much of the first 22 miles. 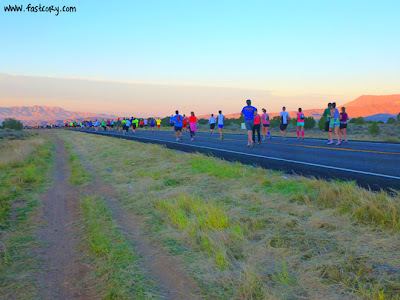 I was surprised to only see two other runners taking advantage of the dirt. 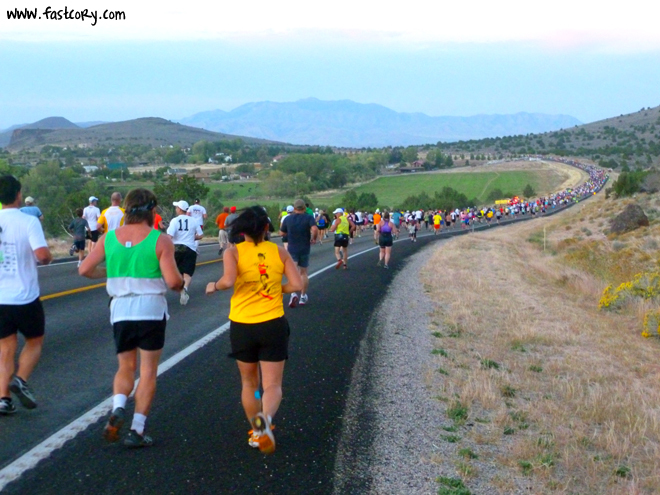 The miles continued to float by and before I knew it we were around mile 7 and the dreaded Veyo Hill. I heard so many people singing "Eye Of The Tiger" that I was able to get up the hill with plenty of distractions. I had one goal for the marathon: RUN A NEGATIVE SPLIT. (Run the second half faster than the first half.) In my previous 12 marathons I have never done this before. I decided I wouldn't wear my watch and would just run by feel. For the first few hours I suffered from a moderate case of TMGS (Too Much Gatorade Syndrome) which resulted in a few quick stops. I also experimented with taking a Gu at each aid station two miles apart which seemed to work fine. At mile 15 runners arrive at Snow Canyon State Park. I always feel like I am running into a watercolor canvas. I knew it was slowing me down quite a bit but I just couldn't put my camera away. (I ended up taking 113 pictures at the race.) The scenery was nothing short of spectacular. At the halfway point everything clicked. I had been wise for the first half and not burned out my legs. I knew this was the point when my race really began. I got into a steady, consistent pace and felt good. 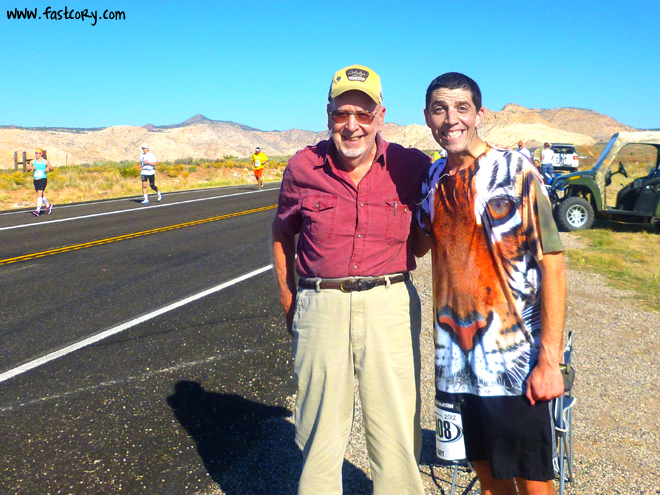 Around mile 17 I saw my grandpa - definitely one of the funniest people I know. He said "Cory, you're not quite winning. But if you hurry I think you have a chance to win!" (There were probably only 4,000 people in front of me.) That gave me a good laugh. My legs had gotten a little twangy and I was on the brink of full blown leg cramps. But I have started to learn how to disconnect with my body sometimes. I would just turn my music up a little and tell my brain to listen to my music instead of my legs. Realizing that I was able to keep pushing forward gave me motivation to keep pushing even harder. 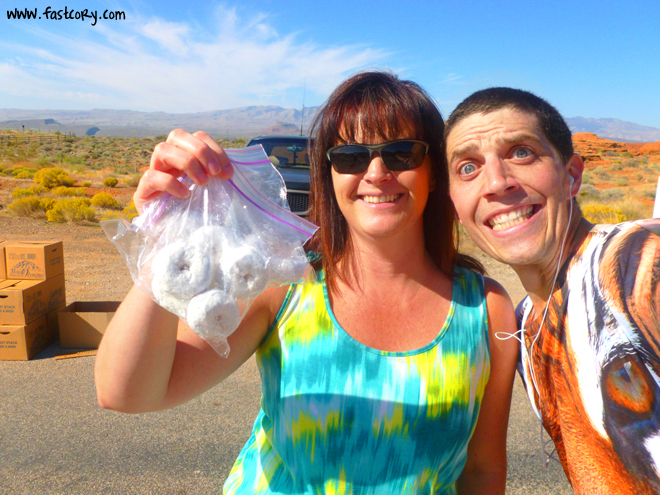 At mile 23 I saw my friend Kelly who knew of my love for Hostess and brought a surprise for me. Did they make me sick? Yep! Was it worth it? Definitely! Thank you Kelly! I kept cruising and could feel my pace getting faster. I gave a high five to every single man, woman, child, and policeman I saw. Research from the Institute for Completely Imaginary Facts shows that each high five you give makes your legs run faster. 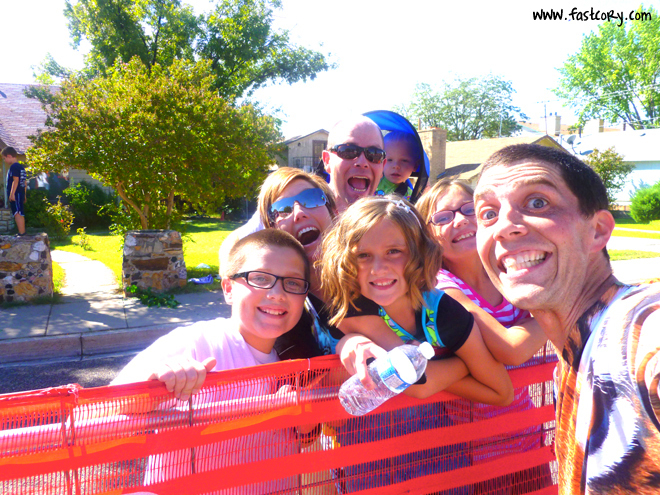 100 yards before the finish line I saw my family and stopped to get a picture with them. Words can't describe how much I appreciate their support. I love them so, so much. I did a big jump across the finish line with a time of 4 hours 49 minutes. It's not my fastest time, but easily the best experience I've ever had at a marathon. My sister finished earlier feeling just as good. She is amazing. If I had scripted the perfect day, this would have been it. 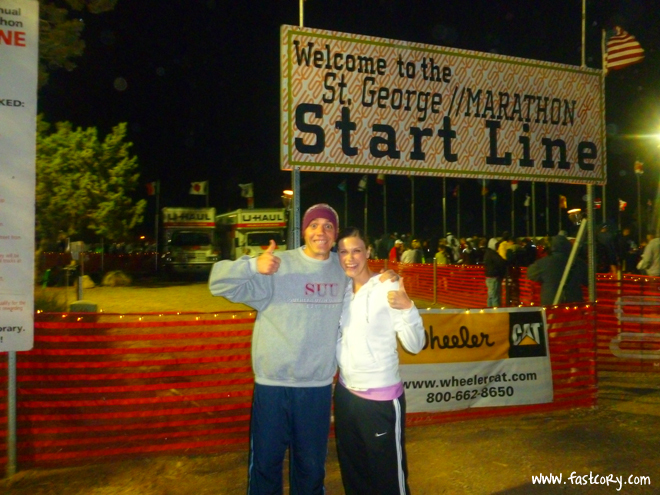 The St. George Marathon organization is flawless. They have created a marathon experience that can't be beat. The volunteers and spectators are amazing. And there is an unlimited supply of ice cream at the finish line! Who could ask for more? I'm thankful that running is hard. I'm thankful the sense of accomplishment that you can feel when you push harder than you thought you could. 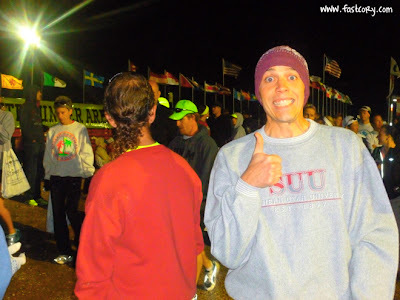 I'm thankful that I've had a few crappy races in the past because it makes the good races even sweeter. 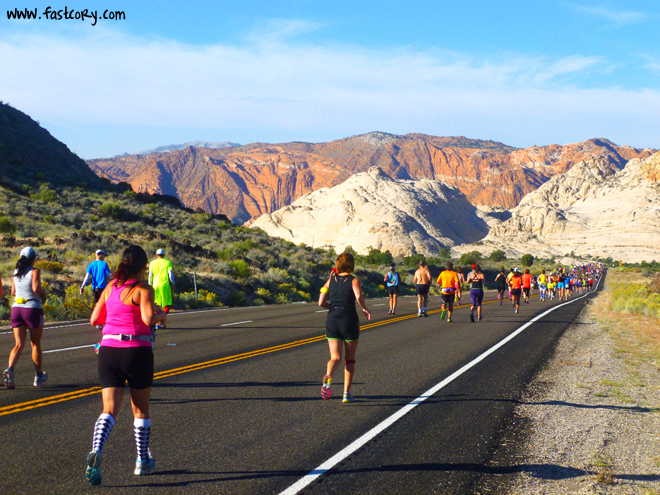 Experiences like this are the reason I run. LOL, love Ponytail Man! Second only to that shirt!!! Wow!!! My local two in Colorado halves that I always get stuck behind are Crazy Hair Korean Lady and Overpronation Girl. Love them both - one of these days I'm going to introduce myself. Glad you had such a wonderful race! Well done! What a race! The shirt was definitely amazing, and those pics were great too! Your grandpa is hilarious, and I'm not sure if I could've downed those hostess doughnuts... Great job, Cory!!! What a great day! I loved your recap and all your pictures. And I'm so happy for Hollie! You are absolutely amazing for doing a negative split and passing all those people! You've got it figured out! And the shirt. Man, you have really got some fashion style going on there. I run in the dirt too when I can find some on the side of the road!! What a great race for you and I love how you make it seem so fun! Bring on Javelina!!! GOOD JOB HOLLIE on your first marathon!! That marathon tracking thing is so cool! I didn't know they could tell you stuff like that! Awesome!! I can't believe you got that time, all the while TAKING PICTURES!! Loved the "tiger" shirt!!! What a feeling knowing that you passed 476 people! WOW! So cool. And Ponytail Man! What are the odds?! That is just crazy...or is it FATE? hee hee. 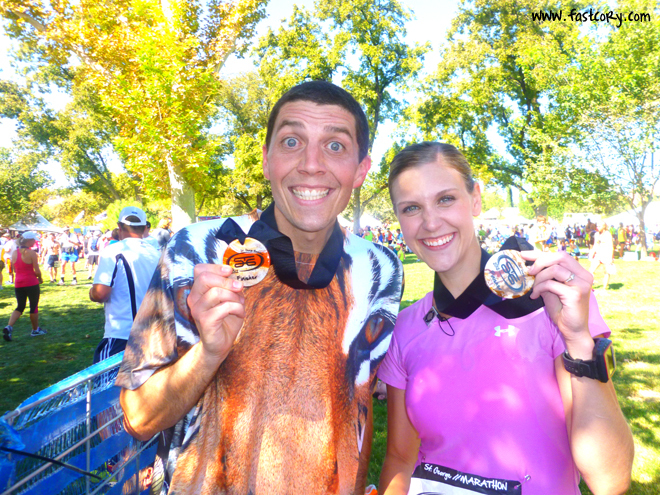 Awesome Cory!I am so glad that you and Hollie had such great races and such a perfect day. Huge congrats!!! Congrats on a great race! That shirt is amazing! 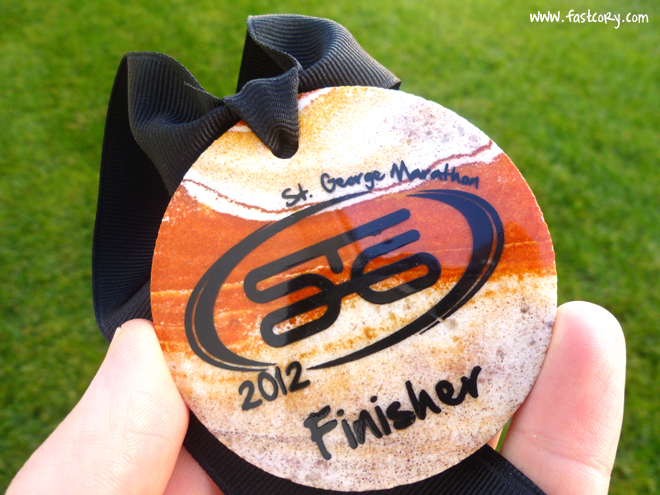 I love wearing something during races that attracts attention, because more people yell at me and keep me motivated. I stick with the sparkle skirt, though ;). They really do know how to put on a race down there! I ate 2 of those big giant popsicles AND an ice cream sandwich. Yum. Plus, all the race stats are awesome! Love that I can see how many people I passed those last miles. What a great race!! I'm definitely going to have to put this one on my list! 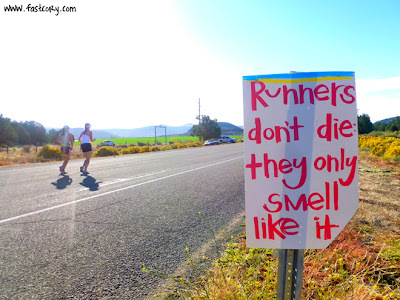 And if I were there, I would have been running in the dirt too! First of all your shirt is AWESOME and it looks like it may match your medal :) I LOVE pony tail guy...that is hilarious! I wonder if he knows how you post lots of pictures of his sweet hair! The picture where you are high 5-ing the lady looks more like you are slapping her face...now that would be funny ;) I love that you take pictures and take time to really enjoy the experience. I think that's the right way to run 26.2 miles! You may have had 4,000 people to pass to win but hey 400 and something is pretty dang awesome!!! Great job! We finished close to the same time, but I'm positive I would have remembered seeing that shirt. Too bad our paths didn't cross, it would have been fun to meet you. Oh, gosh, great recap. I definitely want to run St. George again. I was hurting here and there, but absolutely loved the scenery and the signs. It was really motivating to see that much support. I actually saw that same sign and laughed out loud on that one. But, great job on the race! It was great seeing you again! I thought of you around Mile 24ish when there was a guy sitting outside of his house blaring 'Eye of the Tiger' on his radio. Loved every single word. You are awesome Cory! What a fun race. Two days later, my predominant thought is, "I cannot wait to do that again!!" Thanks so much for your hospitality while we were down for the race, for wearing something ridiculous enough to distract me from my nerves, for sticking with me for the first few miles, and for giving me your copy of the newspaper! It was an UNBELIEVABLY fantastic experience - so much so because of you! Thanks for inspiring me 4 years ago to do this race. So worth it! You HAVE to talk to Pony Tail man!! 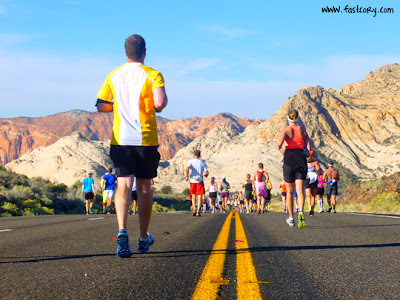 I ran with him during Top of Utah last year for about a mile. He'd run practically a bagillion marathons and was one of the nicest guys ever. Next time you see him- I challenge you to say hello and tell him you're his biggest fan. 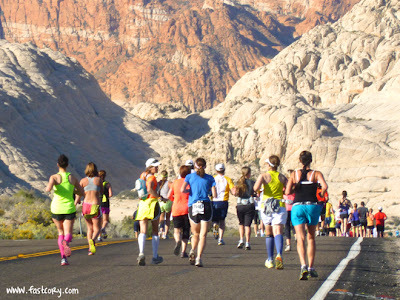 A negative split in a marathon is so stinkin' incredible! Great race, Cory! Love this story. Only sad I didnt get to see you in your shirt in person.. I passed your pony tail dude And laughed hard out loud just At The thought.... This time My prey was The tie dye sports bra chick!!! I think my favorite sign was "if you haven't pooped yourself yet, you've already won" also, on the same topic -- I realize now why guys tend to finish faster than girls.. stopping to take a potty break seriously burns time when you are female. Oh, and AWESOME JOB. love the shirt. seriously love that. you sir, are a rockstar!! Best race review ever. You are awesome! I really want to run this one someday! Great job, and so cool that most of the miles were on dirt! That was the best race report I have ever read. Great work on the split. So glad I got to meet you at the finish line. And thank you for the comment about having bad races so the good ones are even better because I had a horrible run that day and have been discouraged about it. Your positive attitude about everything is awesome. Great job! It sounds like you had a blast! I'm a little sorry I didn't take the time to look for you at the start, it would have been fun to meet you (and stalk you during the race since apparently you get all the bets goodies)! What a perfect racing day it was! Nice job on the negative split! And congrats to your sister on her first! 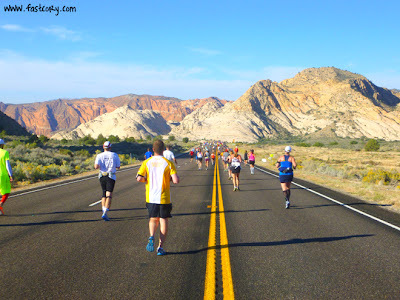 That is really good info about the dirt being right next to the course, that info might have made St George head even more towards the top of my marathon list. Because I'd rather run on dirt than pavement given the choice. And I had a stress fracture a while ago, so it feels better to run on dirt than pavement. 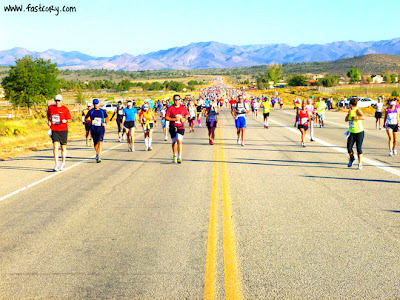 Might try to do this race next year! Well done, Cory! LOVED that marathon when I ran it in '08, such an incredible time - and scenery. It was super cold when I ran it then, and drizzly....ice cream was the last thing I wanted - I may just have to go back one day for that sole purpose :). Congratulations to you and your sister!! You continue to amaze and inspire me!! 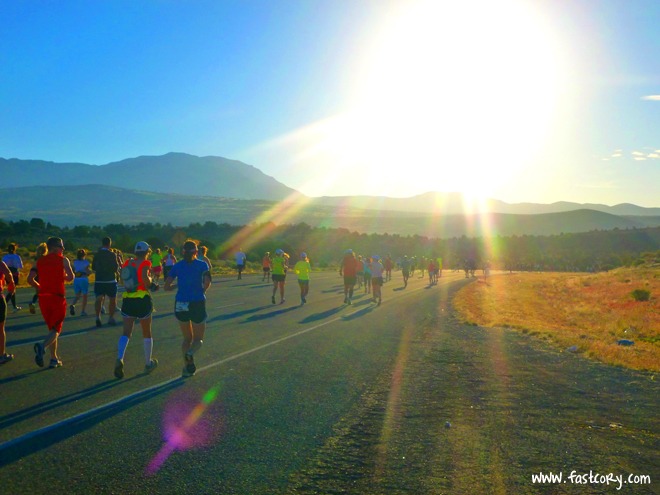 I still can't believe the pix you got during the race - Fantastic! Keep it up! 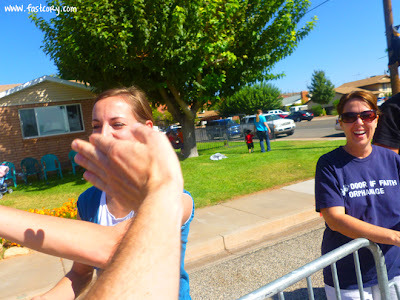 Today I was looking for a photo of the St. George finish line, not the typical photo of someone crossing the finish line, but a photo looking down the street from the last corner where you can see the balloons and know you are going to finish. My little daughter is finishing her mission in Bolivia this week, and she and I ran the SGM together in 2014 before she left. I know that she's at the point where she can see the balloons! My luck today was in finding your blog, I love it! Thanks for sharing so many photos of this and other races.